Is TV Your Weight-Loss Saboteur? Today’s post is courtesy of Matt Denos, PhD, a biologist and writer interested in obesity treatment research and issues related to nutrition, weight-loss and medical diet programs. If you need more reasons to get your family up and about and away from the TV, here they are! Are you aware of how much time you spend in front of the TV? 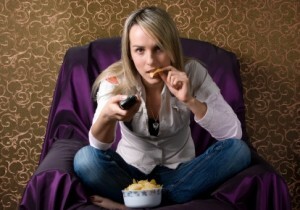 Current research suggests that there may be a link between watching television and obesity. This is bad news for the United States, whose average household watches about 8 hours of TV a day. These days you’ll find televisions sets in every bedroom, in the kitchen, in the garage, and for some TV addicts, even in the bathroom! Are there any consequences to all this television watching? The Nurses’ Health Project, which analyzed the sedentary behavior of 50,000 women between the ages of 30 to 55 years old, found that prolonged TV viewing directly relates to obesity. For every two hours a day spent watching TV, a person’s risk for becoming obese increases by 23 percent. Thus, there is a link between watching television and gaining weight. You may think that only obese couch potatoes gain weight from watching too much TV, right? Well, not exactly. The link between TV viewing and obesity is not only for people who are already inactive and overweight. Research reveals that even people who are healthy and engaging in exercise are at risk for having an increased chance of obesity by watching TV. This applies to both children and adults. Of course, the risk is substantially higher for families who watch TV for 6 or more hours a day. But for every additional hour a day you spend in front of the screen, whether you are in shape or already obese, a kid or an adult, you are increasing your risk of gaining weight. So how does it happen? There are five possible explanations as to why TV can lead to weight gain and obesity. 1. Powerful brainwashing effects of food advertising. When you see food on a TV commercial, chances are they aren’t advertising steamed broccoli. Most likely you will see ads for juicy Big Macs and French fries. Foods that are most advertised on television happen to be the highest in fat and sugar. In a typical one-hour TV segment, you will be exposed to about 11 food and beverage commercials. These are a lot of images being consciously and subconsciously anchored in your mind. It’s not surprising that when you’re watching television, chances are high that you will think about and crave fattening foods. These cravings lead us to eat more than we should, thus contributing to weight gain. 2. Increased calorie consumption. For many people, eating snacks in front of the TV is something they do out of habit. We start to associate TV time as snack time, similar to the way we associate eating popcorn to watching blockbuster movies at the theaters. Have you ever had popcorn during a movie and realized at some point that you were eating the popcorn just as something to do while the movie played, almost like how someone knits while watching TV to occupy their hands? You weren’t eating popcorn because you were hungry. You may have even been totally full, but you kept eating anyway. Imagine doing that kind of eating on a regular basis in front of your television set. Studies have repeatedly shown that meal size depends not only on internal factors (i.e. appetite hormones) but also on environmental stimuli. When we watch TV we make it difficult for ourselves to identify these “internal processing food cues” that naturally make us stop eating. Consequently, you find yourself munching in front of the TV, even if you don’t feel hungry. 3. Unhealthy eating. Eating unhealthy snacks while watching television is common. In one study, researchers examined the eating behaviors of 78 mostly female undergraduate students. The study looked at two conditions: eating when the TV was on, and eating without the TV. Interestingly, the female participants ate more on days when they were eating in front of the TV. In fact, on days when they ate and watched TV at the same time, the participants consumed an extra meal, which increased their daily intake of fat and sugar. 4. Your metabolism slows down. Research suggests that watching television lowers your metabolic rate. In fact, watching TV requires less energy than just sitting on a chair or lying on a bed doing nothing. Studies have shown that a person who watches TV spends 211 fewer calories than someone who simply rests for the day. This effect of TV on the metabolism can further help interpret the observed TV-obesity link. 5. You eat more at succeeding meals. Here is something particularly interesting: People tend to eat more even after they stop watching television. One recent study found that watching television during lunch time increases afternoon snack intake! How can that be possible? According to researchers, eating more at subsequent meals after watching TV may be attributed to the distractibility of TV. People tend to forget what they ate while they watched television and continue snacking the rest of the day. Individuals who eat in front of the TV also have a difficult time recalling later what they ate and how much they consumed. This is important because researchers believe that remembering what we ate in our most recent meal has an impact on how much we will eat in the following meal. This connection was first observed in amnesiacs—people affected by amnesia tend to overeat compared to people with normal memory capabilities when offered multiple meals. Women who participated in the aforementioned study were asked to rate how much they could recall about the lunch they were given. Some women ate lunch quietly, while other women in the study ate lunch with a TV program on. The women who ate their lunch with the TV on were not able to recall as many details about their lunch. This shows that TV stimulates food intake not only while watching television but also at following meals.